Marijuana is a helluva drug, so say Nick and Nate Diaz, Joe Rogan, Jake Shields, Matt Riddle, Dave Herman, Robbie Peralta and countless other stoners across God’s green earth. 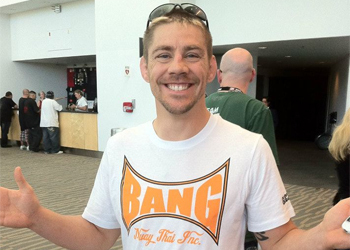 You can now add Duane Ludwig (pictured) to that ever expanding list of pot heads. The retired mixed martial artist turned Team Alpha Male head coach claims he doesn’t blaze just to get high on life, he uses weed to help him gain another perspective when scouting opposing fighters. “It’s freakin’ legal,” Ludwig told MMAMania. “Let me address this issue. When I watch film, I watch film normal how I am now. Then I watch film when I’m high on marijuana. I also watch the film again when I have Alpha Brain in my system. As the old adage goes, “The proof is in the pudding” (Speaking of pudding, rumor has it chocolate pudding tastes fantastic when you’re high). Since Ludwig has taken over Team Alpha Male, TJ Dillashaw, Joseph Benavidez, Chad Mendes and Urijah Faber (twice) have all finished off their opponents in devastating fashion. The quartet has credited their revamped games to “Bang.” So, I guess that means they are also indirectly giving props to pot.